The other day we had posted some thoughts on a casual standard environment Green / White token deck which would make for some good play and great games. To that end, we hit the books to determine which token generators were decent and worth evaluating. 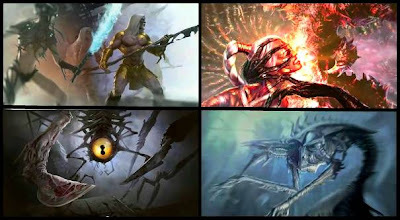 To our horror after some searching we found our earlier article on Scars of Mirrodin tokens, as well as Magic 2011 tokens, but no Mirrodin Besieged token post. 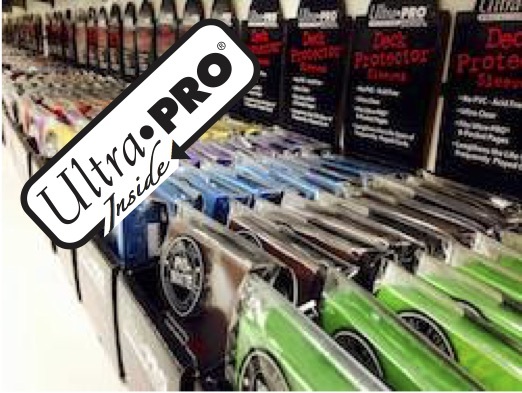 We think it was overlooked in the rush to wrap up the last of the spoilers. Anywhoos, our apologies and here is the missing post. 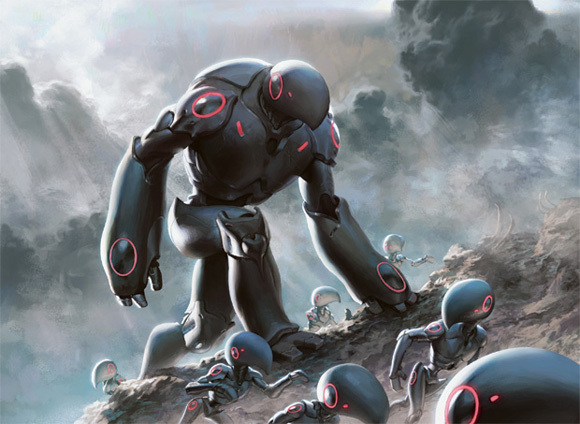 In our opinion, there will always be a token deck popular with casual players like us and as long as Eldrazi Monument is still in standard, perhaps a few on the pro tour circuit. Finally, as you know from some previous posts, MTG Mint Card is donating an incredible 30% of its sales to Doctors Without Borders who provide much needed front line medical aid to areas adversely affected by disasters around the world. This campaign ends TONIGHT at midnight. 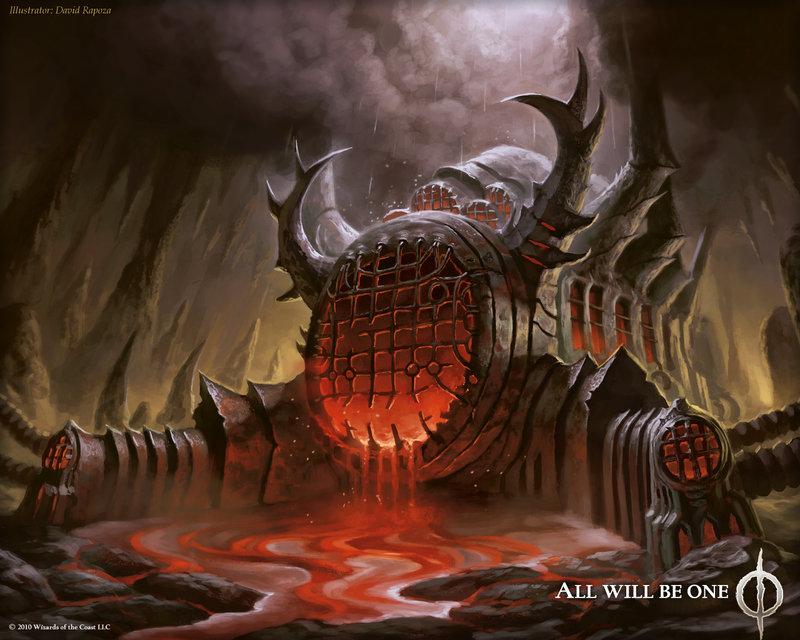 Today we have news which may make electronic gamers who love Magic the Gathering very happy as well as some potential New Phyrexia art spoilers. First up - for those who have just recently acquired electrical power at their abode and have the appropriate devices to operate electronic games, there's a very cool game to play - Duels of the Planeswalkers. Wizards of the Coast and their gaming partners will release Duels of the Planeswalkers 2012 on Xbox LIVE© Arcade, PC/Steam and PlayStation® Network in summer of 2011. Features announced will include all new game modes, Planeswalker opponents, decks, puzzle challenges and other exciting new features including a new-to-digital multiplayer game mode called Archenemy where players gather up to two allies and team up against the AI (artificial intellegence). Let's check out the corporate announcement . . .
Stores in North America and Asia-Pacific for the Duels of the Planeswalkers can sign up to receive promotional kit containing the three foils and kits will also come with an updated M12 Demo Guide, quick reference cards, and Magic 2012 (M12) Sample decks. Stores in the EU will automatically receive the kit. We strongly suggest you check out today's Savour the Flavour article on Wizards. In it, MTG resident art guru, Richard Whitters sits down with MTG artists Jana Schirmer & Johannes Voss for some milk and cookies. 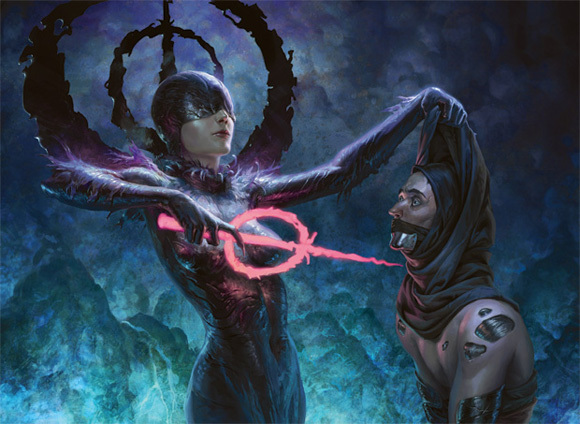 Here at MTG Realm we are of course all about casual Magic the Gathering but we have to admit we have a love for flavour / storyline and of course the amazing art that Wizards puts on their cards. 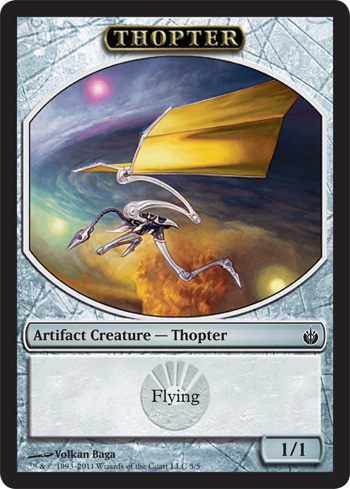 We will also admit playing sub-optimal cards in a 60-card build based soley on art or how coo the card name is . . . it just looks sooo good sometimes on a game table. Anywhoos - back onto the point - in today's article, there are some arts (from Jana Schirmer & Johannes Voss) which we really do not recognise at all and strongly suspect are from the upcoming New Phyrexia set . . . we smell spoilers. Richard indicates that although Janna and Hannes have only completed five Magic cards for Wizards to date, they have 17 either in the works or already completed. Here are three arts we strongly suspect will belong to cards in New Phryexia . . . speculate away ! Someone has been shopping at the Phyrexian outlet store. 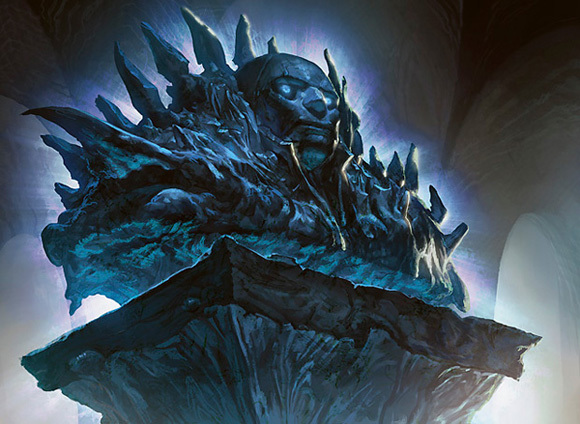 A bust of Karn - chances are we will finally see him as a legendary creature in the New Phyrexia set. 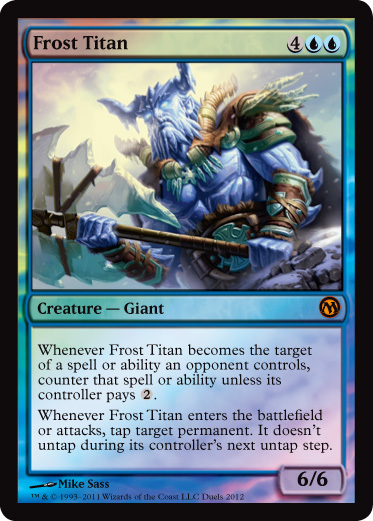 A Myr Titan ? 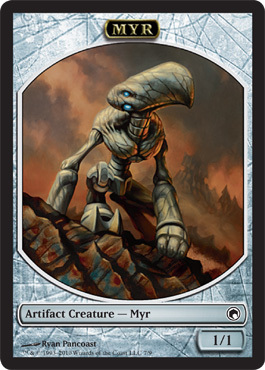 Hopefully the Myr legendary some players have been wanting to see. 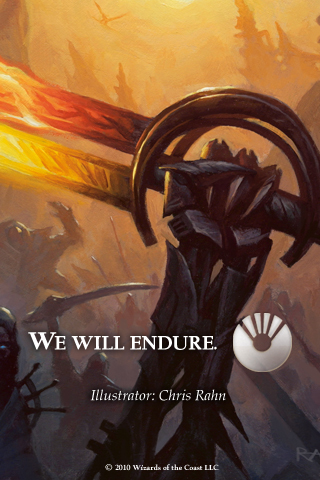 We have news from the trenches on Mirrodin and the ongoing battle between the Phyrexian and Mirran factions. 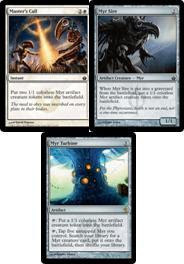 From this announcement over at Wizards, it appears the victor is Phryexia and the third set code named 'Action' in the Scars of Mirrodin Block is New Phyrexia. 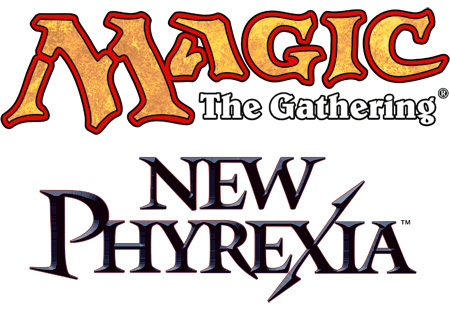 We have the video from Wizards as well as a very cool New Phyrexia card spoiled. Let's go . . . The Machine Orthodoxy today announced total victory for the forces of Phyrexia and the utter obliteration of all that was Mirran. The Great Work is Complete. 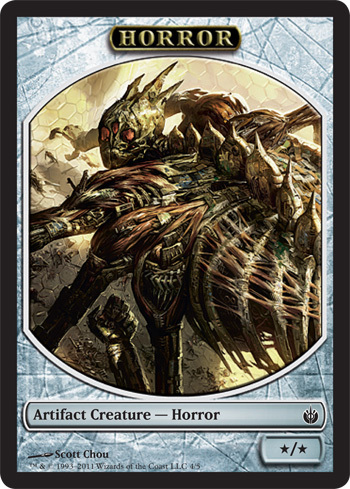 The stain of imperfection which is Mirrodin has been scourged and in its place we have shaped the face of New Phyrexia. The raw flesh we have at our disposal will allow us to continue The Great Synthesis unabated. Our destiny lies outside the crude battles between slavering beasts of which we have endured these many years. Through our experimentation will arise the strength of New Life. The struggle for survival is never complete. Wherever there is weakness, there is still the necessity of conflict. As the predator cannot abide prey, so do the strong feed upon the strong. Our purpose has only begun. And now for the bombtastic card, Elesh Norn, Grand Cenobite which promises to rock your game. Personally, we want to be the first kids on our block to drop what we're calling Lady Gaga for now in play for epic win. First things first - this is a legendary creature. 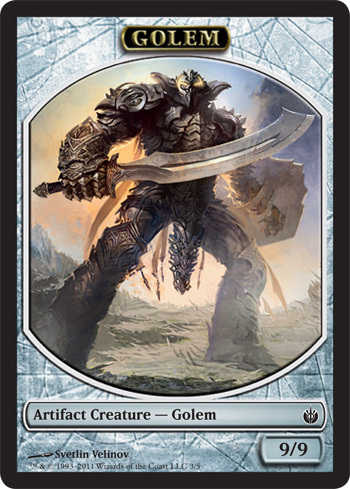 Legendary is a supertype that can be found on artifacts, creatures, enchantments and lands. 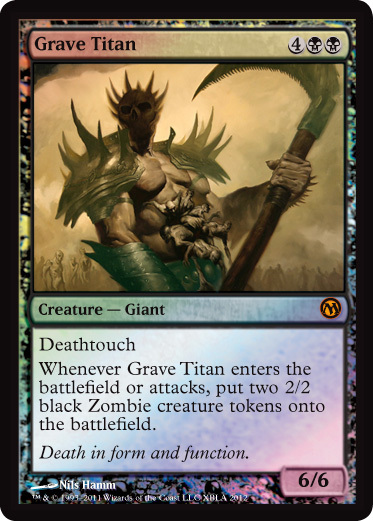 As such, just like Planeswalkers, if two or more legendary permanents with the same name are in play, all are put into their owners’ graveyards. The casting cost is somewhat prohibitive at 7 but given the effects, we think that casual magic players will still love it and play it and may even creep into sideboards against token generating decks. 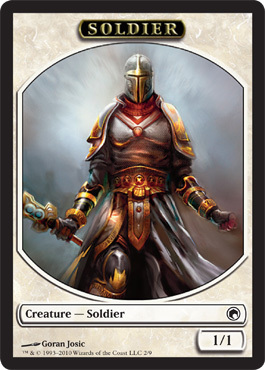 We hope to see the remainder of the Praetor cycle in this set - perhaps even a larger theme of legends in a similar tone of that in the Kamigawa Block. 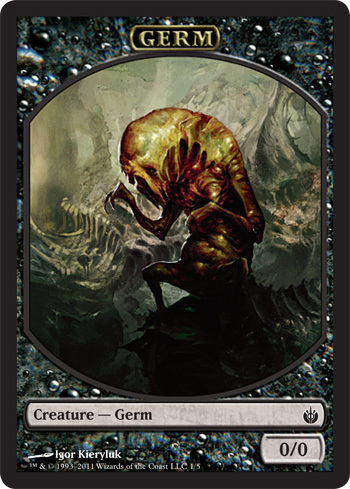 Finally, the vital information for the New Phyrexia set . . . Finally, as you know from some previous posts, MTG Mint Card is donating an incredible 30% of its sales to Doctors Without Borders who provide much needed front line medical aid to areas adversely affected by disasters around the world. This campaign which has run almost all month long will come to an end on March the 31st. We hope you had a great weekend and had time to get some Magic the Gathering games fitted in. As for ourselves, we had an opportunity to make tracks over to the local gaming store, OMG Games in Barrie, Ontario where they had a good turn out of 48 players competing for a Worldwake Fat Pack. Unfortunately we had to drop early but were sure we will find out if the winner met with success with the Jace 2.0 lottery. On Saturday we went back to the binders and looked over some of our older (still standard legal) cards and reminisced a bit. To this end, we brewed up an nostaligic casual deck, which although might not be able to take on some of the premier net decks, still would deliver very well on FUN. This had won only half the games we played with so far (against an Elf deck and a Tempered Steel deck) but they were certainly very close. Let's have a look at this odd brew of Green / White tokens . . .
4/4 Beast tokens (via Rampaging Baloths). Altough we are not aiming for an overun effect (a pump / trample spell), there still is that capability with Garruk's last ability. Primarily, we are focusing on putting our opponent on a fast clock by puking a variety of tokens (most of which are provided with landfall triggers) and getting to a point where we can set up a variety of win conditions. Resetting the board with Day of Judgement, Elspeth Tirel or even Novablast Wurm and a fast recovery and a swing in for lethal damage. Extra critical card draws are provided with Wall of Omens and Explore while additional land drops to trigger landfall abilities are provided with Harrow as again with Explore. 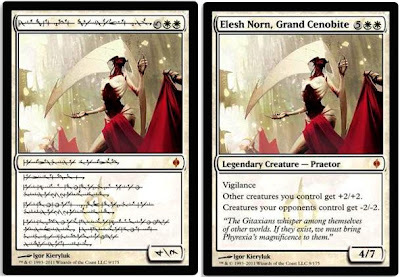 Should we be able to get Eldrazi Monument out followed by Day of Judgement, Elspeth or Novablast, then things are certainly going quite well and promises of a game win is almost assured. 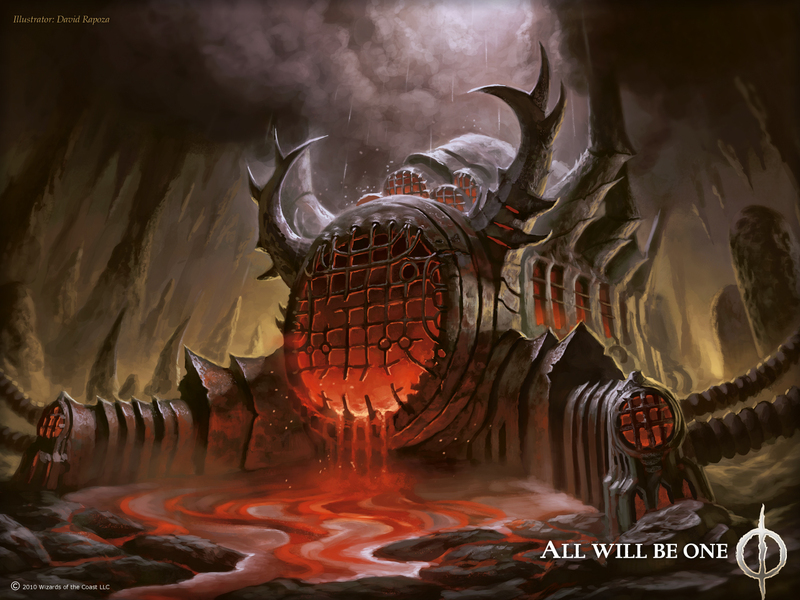 Anywhoos - as always, please pipe in with suggestions for the maindeck or sideboard (as we have not yet developed one) in the comment thingy below or by eMail. If this build gets some decent games in, we may even consider taking it from the kitchen table for a spin at FNM. We have for you another excellent instalment of Magic the Gathering wallpapers from the upcoming set 'Action' as well as some rather exciting news about Friday Night Magic which we're sure will get the juices flowing for most every Magic player out there. Before we get to the post, why not take some time out to listen to Rebecca Black's 'It's Friday' song on the 'Tube. It's kind of like pouring a highly corrosive cleaner directly onto your brain and we're calling it right now - 'What was heard can never be unheard'. Thankfully, the internets are chocked full 'o' parody vids which may make the burning go away. 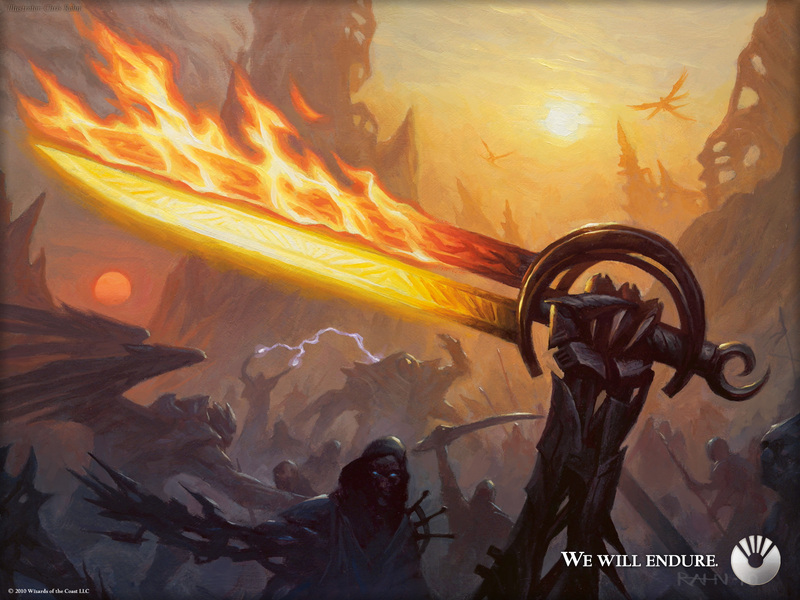 "So," the Vulshok warrior rumbled, "you're responsible for this blade." "Desperate times call for desperate measures," the Auriok edgewright replied quietly. "Our people are known for their smithing skills." The Vulshok examined the sword carefully. "Perhaps. But we Vulshok know a thing or two about weapons as well." He smiled. "I want to suggest some... alterations..."
Ladies and Gentlemen - start your speculations ! The art from Chris Rahn on this last in the sword mega cycle is most excellent. 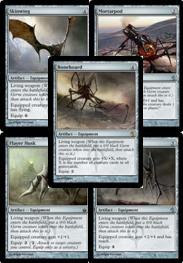 In this mega cycle, each Sword of X and X were equipment artifacts with a casting cost of 3 and an equip cost of 2 mana. They each boosted power and toughness and provided protection from two enemy colours which are hinted at in the art as well as the name of the sword. Each sword has a trigger when damage was delivered. The four swords so far are Sword of Light and Shadow and Sword of Fire and Ice from Darksteel, Sword of Body and Mind from Scars of Mirrodin, and Sword of Feast and Famine from Mirrodin Besieged. This obviously is the Red and White sword. Your homework is provide in the comments below your educated guess. 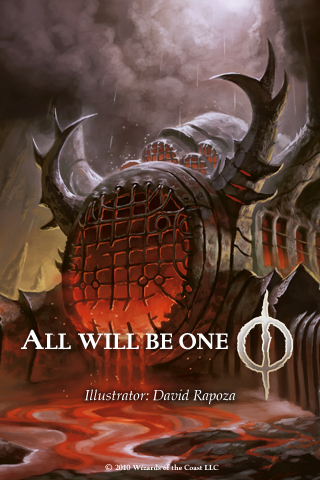 This art from David Rapoza is amazing. Our guess for this card involves a comes into play wording for 3 counters which the controller taps to remove a counter not much unlike Tumble Magnet with the result that target player cannot cast creature spells that turn. The store we go to sling cards (OMG Games) is providing an amazing prize for top spot in tonight's Friday Night Magic event . . . a Worldwake Fat Pack. Yep - the set which birthed the most expensive card in standard. 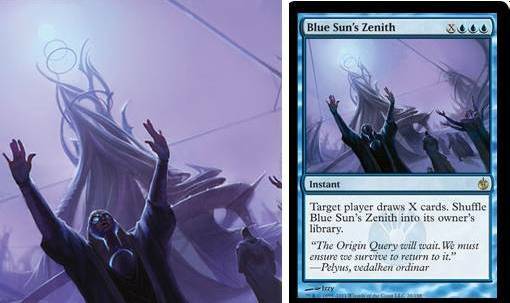 This of course is a lottery and the winner has 8 chances of pulling a Jace, the Mind Sculptor. For a $6 entry fee, you have the chance to win a Fat Pack (estimated cost around $90 and a chance of opening up one or more booster packs containing a $100 Jace - not too shabby. So - if you are within a hour's drive to the store in Barrie, Ontario, we suggest you plan to put your behind in a seat tonight. Play starts shortly after 7:00 pm. 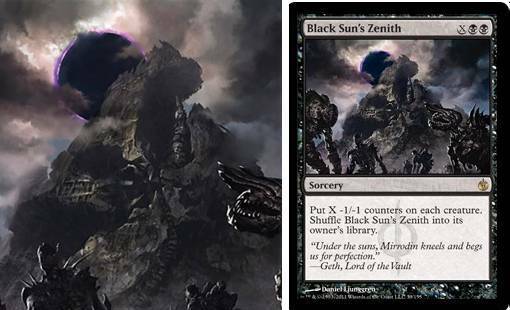 Today, we are looking at the Zenith Cycle of cards from Magic the Gathering's last set, Mirrodin Besieged to determine which rocks your game and which gives you sad panda were you to rip a booster pack to find it in the last slot. We have had almost two months of playing with these so we know you have by now formed an opinion. Anywhoos, for those of you not that familiar with the Zenith Cycle, there are a cycle of rare spells with X in their costs and named after the five the coloured suns of Mirrodin. The card, after played (and resolves successfully), shuffle themselves back into your library to be used yet again. 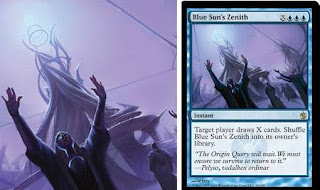 The Zenith Cycle is rather similar to the cycle of Beacons from Fifth Dawn (Beacon of Immortality, Beacon of Destruction, Beacon of Creation, Beacon of Tomorrows, and Beacon of Unrest) in that they shuffle back in your library again. 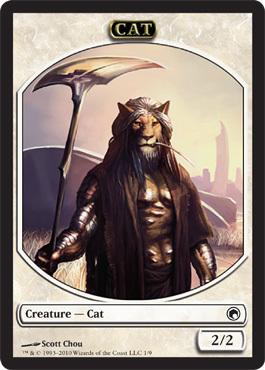 Put X 2/2 white Cat creature tokens onto the battlefield. 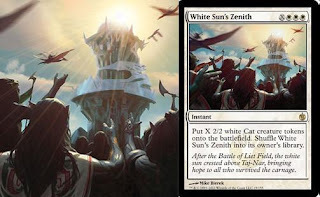 The white zenith art is set in Taj-Nar, the capital of leonin culture and home to LOLCats. We love the ability to be able to drop a truck load 'o' kitteh at instant speed. If you just spent one mana as 'X', then times must be tough and we're guessing your game is going straight into the crapper, however, if you perhaps had some green mana ramp or just dropped this late game, then we expect you've just unleashed furry heck upon your opponent and we salute you. Zenith into its owner’s library. The blue zenith art is set in Lumengrid, the city in the Quicksilver Sea occupied by vedalken and Neurok humans. This is rather similar to Stroke of Genius which to our knowledge only received a mildly welcome response from players. We realise that being able to draw cards is good and often critical for control decks and that with enough mana, one may be able to use this as a quasi-mill effect to have the opponent draw a large number of cards only to discard most of them BUT dang! - this one really does not look at all promising. Put X -1/-1 counters on each creature. Shuffle Black Sun’s Zenith into its owner’s library. The black zenith art is set in Ish-Sah, hub of the Mephidross and stronghold of Geth, originally depicted on Vault of Whispers. 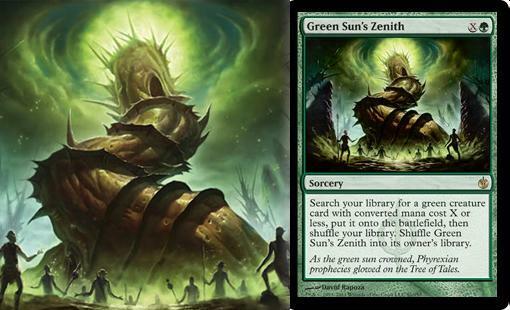 With a good number of cards in standard today having regeneration or indestructibilty, this card is most welcome. With the exception of Melira's Keeper, this card provides a great answer to a variety of critters, whether it be tokens or fatties - just ensure you strategically scale your mana and drop on target. 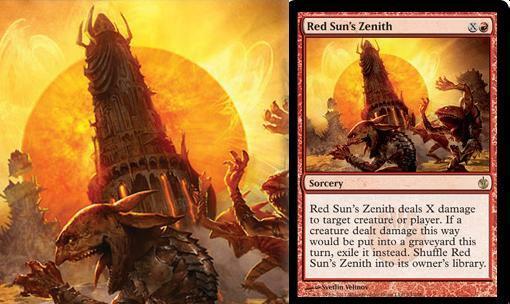 Red Sun’s Zenith deals X damage to target creature or player. 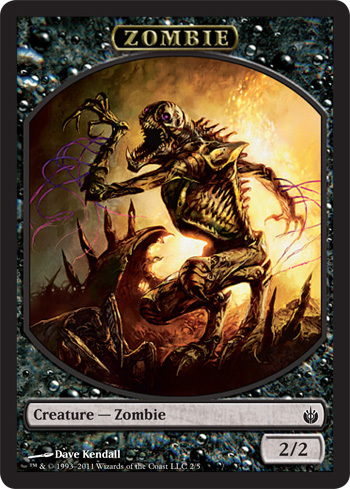 If a creature dealt damage this way would be put into a graveyard this turn, exile it instead. Shuffle Red Sun’s Zenith into its owner’s library. The red zenith art is set in Kuldotha, a forgelike city sacred to Mirran goblins. The red zenith is essentially a Disintegrate (Time Spiral and other sets). 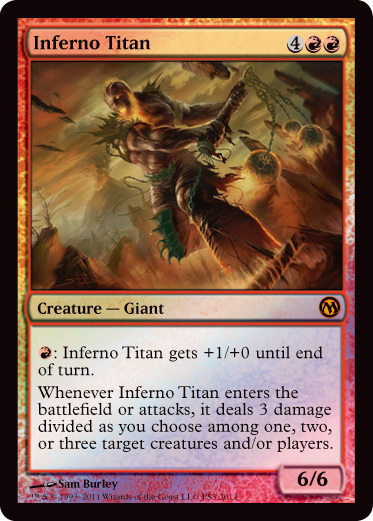 The complaint we have heard from some players is that although they love the unlimited mana they could sink into this, they would have have had this card go further so it cannot be countered or have the damage prevented along the lines of Banefire or Demonfire. Search your library for a green creature card with converted mana cost X or less, put it onto the battlefield, then shuffle your library. Shuffle Green Sun’s Zenith into its owner’s library. The green zentih art is set in Tel-Jilad, that legendary massive copper "tree" in the Tangle that is inscribed with Mirrodin's history. Most players agree that this card is simply bombtastic. There is not much of a downside with being able to dig into your deck for a Thrun, the Last Troll, or perhaps a Progentius. A card like this allows for a green creature tool not too unlike Fauna Shaman and frees up space in your 60 by providing the possibility of singletons. Check back to see results.